DONCASTER and DISTRICT CAMRA – Welcome, by visiting our website you wil not be subjected knowingly to cookie applications but Website statistics are taken. 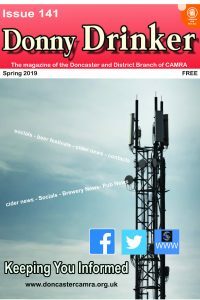 Welcome to the Doncaster and District CAMRA Website. We hope that you find it informative and beneficial. The Doncaster and District Branch supports and promotes the availability of real ale and real cider/perries in pubs and clubs in the Doncaster area. Please note, the site uses Links to E-mails and other information that you may find useful. The links are highlighted in Blue and are Underlined , hover over the link and click. Click on the image to load a PDF of the latest edition of Donny Drinker. Click on image to go to the Whatpub website to find information on pubs throughout the country. 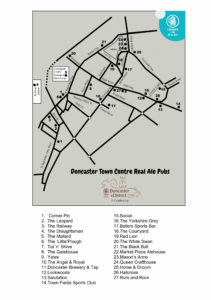 Click on image to load PDF of map showing location of all Doncaster town centre pubs.